Whether you were considering fillings or already have a few, it’s important to make sure your dentist is updated on the safest materials to use. Unfortunately, this is not necessarily the case for many doctors across the country. In fact, only 50% of dentists no longer use amalgam fillings to treat cavities, despite their connection to mercury exposure. Based on a plethora of research, there are several reasons that amalgam (also known as silver) fillings pose a risk to you and your family. Your Fort Worth dentist breaks them down inside. Mercury is defined as the most poisonous, naturally occurring, non-radioactive substance on the planet. Currently, there is no amount of exposure to mercury that can be considered safe according to the World Health Organization (WHO). To better understand it’s toxicity, consider the Occupational Safety and Health Administration’s (OSHA) stance on mercury use in the workplace. They state that any facility containing 100 micrograms or more of mercury per cubic meter of air is considered toxic and therefore unsafe for employees to work in. Furthermore, the following information as it relates to amalgam fillings may shock you. How Does It Relate to Amalgam Fillings? An overwhelming majority of this mercury is absorbed, about 80%, afterwards. In fact, brushing an amalgam filling can release more than 250 micrograms of mercury per cubic meter of air, nearly three times what OSHA considers a toxic level of exposure. 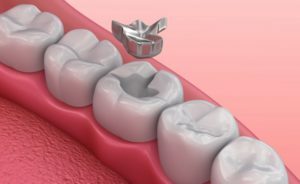 As a result, countries like Norway, Denmark, and Sweden have permanently banned the use of amalgam fillings for use in patients. Despite this knowledge, some dentists insist they are harmless and are still able to install amalgam fillings in the U.S. A common argument made to defend the practice is saying they’ve been used for over 180 years. However, this doesn’t address the thousands of studies that prove mercury to be more poisonous than cadmium, lead, and arsenic, elements you wouldn’t dream of intentionally putting in your body. Defenders have also stated that only a small amount of mercury is released from amalgam fillings and not enough to be toxic. Considering how much mercury is released from brushing amalgam fillings alone, you must ask yourself: “Am I willing to expose myself to mercury just to keep my silver fillings?” Wouldn’t it make more sense to avoid any chance of exposure to toxic elements if you could, rather than settle for the so-called “small amount” defenders claim, especially when it research disputes it? Don’t settle for a dangerous to solution to your cavities. Contact your dentist in Fort Worth to let them know you stand against amalgam fillings and mercury exposure. For over 25 years, Dr. John G. Boyd D.D.S. has provided the safest and most comprehensive dental care for his patients. After graduating from Texas State University, he eventually when on to earn his dental degree from the University of Texas Dental Branch-Houston. He’s also the only Fort Worth dentist to become an accredited member of the American Academy of Cosmetic Dentistry. To learn more about his practice, you can contact him at (817) 882-8282 or visit his website.